This is a refreshingly innovative tribute to Antonio Carlos Jobim, since only three of the fifteen tracks were actually written or conceived by the legendary Brazilian genius. The rest were favorites of his that were written by others, such as his lesser-known countrymen (Johnny Alf, Bororo and Edu Lobo), more internationally recognized names (Caetano Veloso, Joao Gilberto), and Maucha Adnet and her brother, Mario. There's also a trio of jazz standards, including Cole Porter's "I Concentrate on You," which Jobim wished he himself had written. 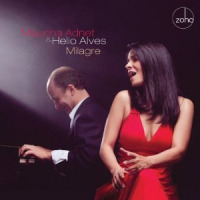 We know this because of Maucha Adnet, the Rio-born vocalist who toured with Jobim for ten years and learned the songs on this release from him. Jobim described Adnet's voice as "deep, rich and mysterious"and I would add "supple," "sultry" and "soulful" to that, not just because of the alliteration. Adnet's beautiful instrument gets the perfect setting from these musicians and arrangements: not only is the estimable Trio da Paz on this recording (Romero Lubambo, Nilson Matta, Duduka Da Fonseca), but there are wonderful performances from trombonist Jay Ashby, flugellers Claudio Roditi and Randy Brecker, and pianist Hugo Fattoruso, whose spare, lyrical style evokes The Man himself. It's difficult to pluck highlights, but to these ears, Adnet sings "I Concentrate on You" as if Jobim had written it, giving it his patented sensual treatment. "So Danco Samba" is a party (Adnet includes Jobim's familiar "A Train" reference), as is the joyful closer. Then there's the gorgeous, rarely-heard "Dom de Iludir" and "Choro Bandido" and "Ceu e Mar," the tuneful, welcoming opener. Songs I Learned From Jobim contains a full range of moods, fine musicianship and excellent material. It's also an must-hear for Jobim completists, since it offers such unexpected and delightful insights into his musical self. Track Listing: Ceu e Mar; Vai Ficar Bom; There Will Never Be Another You; Choro Bandido; So Danco Samba; Curare; Dom de Iludir; Bim-Bom; I Concentrate on You; Aguas de Marco; Sublime Tortura; These Foolish Things; Pra Que Discutir Com Madame; Maracangalha; Vignette Maracangalha (Jobim's concept). Personnel: Maucha Adnet, Mario Adnet, Alana da Fonseca: vocals; Mario Adnet, Romero Lubambo: guitar; Hugo Fattoruso, Dom Salvador, Alfredo Cardim: piano; Nilson Matta: bass; Jay Ashby: trombone; Z Luis Oliveira: flute; Claudio Roditi, Randy Becker: flugelhorn; Hugo Fattoruso: accordion, keyboards.